Finally! Here is a peek at my new room. See the 'BEFORE' pictures HERE. Open house was a huge success. 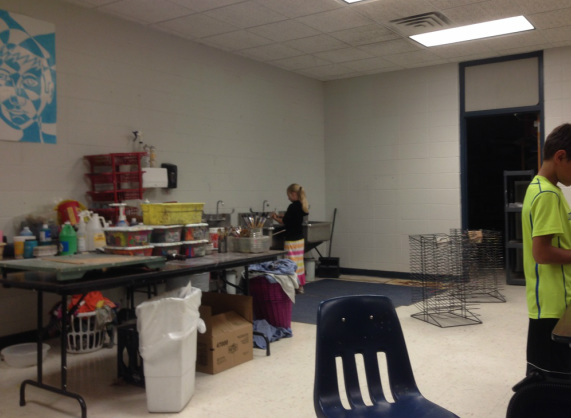 Many of the 6th graders were like WOW, it is so clean in here! It is like a completely different room. They were blown away. I also had several parents offer to volunteer....I've haven't had a lot of that before, but it is very exciting to have those eager parents who are so supportive right out of the gate!! The black and white mural in the corner was already in the room when I moved in, so I am lucky to have it. A student who helped paint it stopped by with her brother and I got meet her and she wrote her name below it. Cool moment! The tables were donated by a great friend, champion, and mentor Josie Mai. The shape and dimensions of the tables allowed me to really rearrange things in the space. Most of the decor was given to me by students, like this awesome metal plaque above. LOVE THIS!! Or found at garage sales and flea markets. The mona lisa curtain was found at a garage sale several years ago for $15!! You might want to refer to the BEFORE photo here to see the transformation in this corner. Love how the beaded curtain is reflected in one of the mirrors. I've collected those mirrors at flea markets over the years. I was very lucky to have the chance to get the district wood shop crew into the room over the summer to build the bookcase and the cabinets. Love those Crystal 'Why We Teach Art' display cards. Perfect for finishing off a board! If you are looking for FREE---COOL--COLOR--printable--CLASSROOM--signs, LOOK HERE. To label my tables by color, I spray painted old paint cans, and then dripped paint down the sides. I used glow-in the dark paint, glitter paint, whatever. They are lightweight and look really cool hanging from the ceiling! I'm excited for the year to start! If you are ever at the middle school, stop by and visit!! Wow, Nellie!! You did a fantastic job! I'd love to see your room in person.